Er doen inmiddels al 44 leden mee. We got something special in store for all you Terror Heads out there. In collaboration with Club U, Underground Resurrection and Carpenoctum we planned a new party full of Terror, in a sick underground location. We invited CSR for our very first party in the Netherlands. 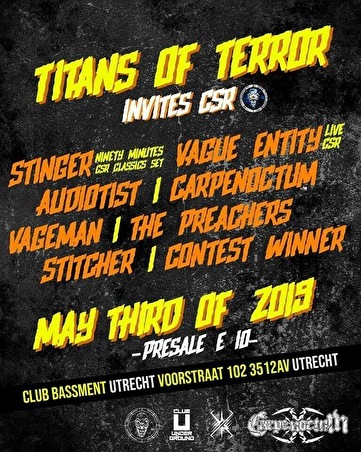 DJ Stinger is going to play 90 minutes full of CSR Classics and Vague Entity will do a crazy live act, with his CSR releases. Make sure you don't miss this! 7 Hours long the sickest Terror! Check out our complete line-up .